Prime Minister Sheikh Hasina on Monday urged the businessmen to explore new markets, produce new products and maintain their quality to exploit export potentials in the competitive world market, reports UNB. “You (businessmen) have to look for new countries and new markets and assess the demands in those markets. If we can do that we’ll be able to boost our business. We also need to main the quality of our products, make them attractive and brand them. All these things are very much important,” she said. 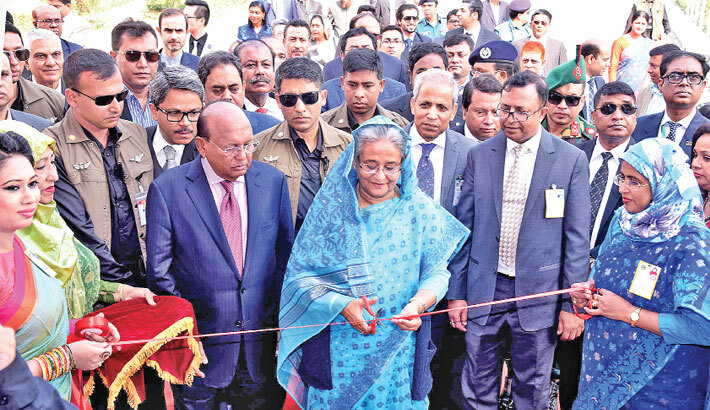 The prime minister made the call while inaugurating the month-long Dhaka International Trade Fair (DITF) at Bangabandhu International Conference Centre (BICC). The Ministry of Commerce and Export Promotion Bureau (EPB) jointly organised the fair to showcase Bangladeshi products. Sheikh Hasina assured the businessmen of providing her government’s all-out support to expand the export basket of Bangladesh. “We’ve already extended our all-out cooperation and will do the same in the future,” she said. The prime minister mentioned that Bangladesh is currently exporting 750 items to 199 countries across the globe. Sheikh Hasina said the businessmen should also look at the domestic market to expand their business. “You have to work to enhance the purchasing capacity of local people... If you want to market your products locally, it is essential to increase the purchasing capacity of local people,” she said. Commerce Minister Tofail Ahmed, Chairman of the Parliamentary Standing Committee on Commerce Ministry Tajul Islam Chowdhury, Commerce Secretary Shubhashish Basu, FBCCI President Shafiul Islam Mahiuddin and EPB Vice Chairman Bijoy Bhattachariya also spoke at the inaugural programme. Referring to setting up of 100 special economic zones in the country to boost export and industrialisation, Hasina said steps have been taken to encourage foreign investment. She said some 17 missions, including 12 new embassies in 12 countries, have been opened during the current tenure of her government aimed at expanding trade and commerce. The PM mentioned that directive has been given to the ambassadors and high commissioners of Bangladesh serving in different countries to be more active in attracting foreign investors and businessmen. Describing pharmaceutical industry as a high technology industry, the Prime Minister said Bangladesh is currently exporting pharmaceutical products to over 100 countries, including the USA, the UK, the European Union and Australia, after meeting the country’s 98 percent demand. She mentioned that work has started to establish pharmaceutical raw material production park at Munshiganj aiming to further improve the sector. Hasina also announced pharmaceuticals and their raw materials as the ‘Products of the Year for 2018’ to take the industry to a dignified position, and expressed her firm optimism that Bangladesh will be able to achieve a respectful status very soon in this sector. The Prime Minister also urged all concerned to focus more on the ICT and leather sectors and said these sectors has huge potential in the country and abroad.